At the recent North American Diamond Club, Amway announced a proposal for significant changes to the basic compensation plan in Amway’s oldest market. Probably the most obvious change is the removal of the 3% and 6% bonus brackets, combined with halving the group volume requirements for 9% down to 300PV. Last week, following a teaser video released by Amway, I asked What is Amway’s mystery new sponsorship? Well it seems the answer has leaked on Amway’s website (thank’s Carl for the tip!) 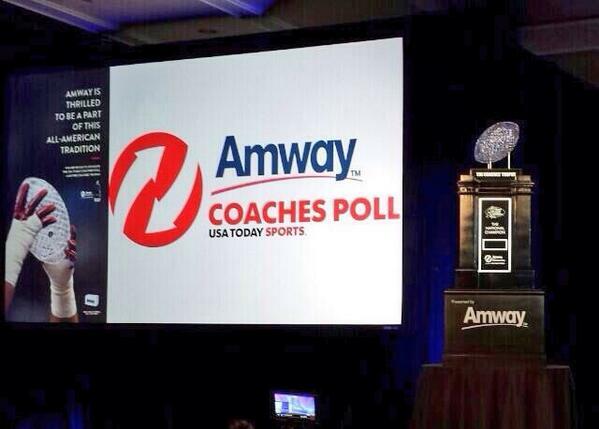 so 3 days before the announcement at Diamond Club we can break the news that ….. Amway has entered an exclusive partnership between Amway, the United Football Coaches’ Association, and USA TODAY Sports. The sponsorship reportedly covers the next three College football championship games and playoffs as well as the coaches poll. That seems a little more realistic! For non-Americans, the NCAAF is College American Football and it has a HUGE following in North America, with upwards of 50,000,000 tickets sold to college football games. So while not quite the global impact the initial announcement suggested, this is a very significant announcement for Amway North America. I’ve read the wikipedia article, but to be honest I’m not sure that I grasp what the NCAA Coach’s poll is, but it appears to engage a lot of people – can a fan explain in the comments? What is Amway’s mystery new sponsorship? The video references earlier sponsorship deals, with a “Crown” and a “Champion”, with a football as a hint. It’s obvious these refer to Amway’s earlier sponsorship of the Miss America contest and their recently retired sponsorship of NFL legend Kurt Warner. Get ready for a sponsorship announcement that will really move the ball! This month, Amway will kick-off an exclusive national sponsorship program that has the potential to capture the attention and active participation of more than 2 billion people! This history-making partnership will provide an undeniable appeal to individuals of all ages! Look for complete program details to be announced on February 19. In the meantime, you’d better put a helmet on because it’s going to be a huge hit! We have to wait a little over a week until the announcement, but I can’t help but theorize – it’s a national sponsorship program, which implies the United States, but it has “the potential to capture the attention and active participation of more than 2 billion people”, which is way more than the entire population of North America – so it’s a national sponsorship with global reach. But how can a sponsorship of some US based sport gain the active participation of people around the world? Or is it a sport? “Champion” certainly implies it is. So I googled around. Around 3 billion people watched the last Football World Cup. I’ve been unable to find data for the NBA, but it has big coverage in China – Amway’s largest market. The NFL is over for the year. NHL doesn’t have the global coverage. Formula 1 does, but it doesn’t tie in at all with Amway’s health & beauty market image, nor does the hint in the headlin for “move the ball” fit. Football initially seems the most likely market – Amway sponsors the Amway Canadian Championship, they work together with AC Milan in Europe, and have previously sponsored both the San Jose Earthquakes and the LA Sol, as well as footballing superstars like Ronaldinho and Marta. Frankly I’d be stunned if Amway sponsored the World Cup finals, but it’s in Brazil, so it’s not a “national sponsorship” for the US. Neither would say, sponsorship of the Champions’ League in Europe. The only US-based sport I can think of with large global appeal is the NBA – so perhaps Amway sponsoring the NBA finals? Only other possibilities I can think of – US Open Tennis, US Open or Masters Golf? Any others? And how does any of this get “global participation”?? Update: Major League Baseball is another obvious option I missed – it’s a national sport in the US and it involves both balls and helmets. Amway has an existing relationship with MLB – but does it actively engage 2 billion people? Frankly I’m beginning to suspect I’m completely on the wrong track – heck, it could even be something with BodyKey and a weightloss related TV show like The Biggest Loser? After all, it’s estimated 2 billion people are overweight, and I’ve discovered that Amway and The Biggest Loser Resorts share the same supplier for their weightloss support websites. Update2: Amway’s new sponsorship revealed! Amway North America has a new Business Opportunity Brochure (BOB) out and it has some new statistics on average incomes.